Draft: 2001, Seattle Mariners, 2nd rd. He and his wife, Mariel Perez, are both from Bayamón, Puerto Rico...they grew up two stoplights from each other but did not meet for the first time until they were both in the United States when René was playing for Minnesota...they have two daughters (Julianna Renée and Ivanna Mariel)...His wife, Mariel, is the daughter of Eddie 'La Bala' Pérez, founder of El Gran Combo in Puerto Rico... Attended the same high school as current Twin Jose Berrios (Papa Juan High School in Bayamón)...Grew up with Yadier Molina and played with him at the amateur level for several years...During the 2017 offseason, Rivera and his wife created an initiative called "That No Child Loses Their Illusion" or "Que Ningun Niño Piedra la Ilusion" in partnership with Kmart and Sears to help children and their families in Puerto Rico who were displaced by Hurricane Maria...The couple collected 25,000 toys during toy drives in Miami, Chicago and Arizona and then went to Puerto Rico in mid-December to distribute the gifts to help the children and families receive some holiday cheer...Rivera, along with fellow Puerto Rican teammates Javier Báez and Victor Caratini started a GoFundMe page in September, 2017 that raised more than $39,000 for recovery efforts in Puerto Rico from Hurricane Maria. Began his first season with the Angels and made the Opening Day roster...Hit .323 (10-31) through his first 12 games in March/ April but then went 4-for-23 in May...Was placed on the 10-day injured list on May 20 (retro to May 17) with right knee inflammation... transferred to the 60-day injured list on June 23 and was activated on August 15...Was claimed off waivers by Atlanta on August 29 and activated on September 1... Appeared in three games for the Braves during September and went 0-for-4. Signed as a minor league free agent by the Mets on April 5...Had his contract selected from Las Vegas (AAA) of the Pacific Coast League on April 26...Appeared in 59 games behind the plate and made 54 starts at catcher...Threw out 18 of 61 (29.5%) potential basestealers...His career caught stealing rate of 36% (104-182) is third-best among active catchers...Trails Yadier Molina (42 percent, 301-421) and Ryan Hannigan (37 percent, 134-230)...Mets pitchers had a 2.77 ERA (148 earned runs/481.2 innings) when Rivera caught (59 games)...The Mets were 34-20 in his 54 starts...His six home runs were the second-most he's hit in his career in a single-season while his 26 RBI were tied for the second-most in his career...Recorded his first hit as a Met with a two-run, goahead homer on May 4 vs. Atlanta...Hit a two-run, pinch-hit homer on August 17 at Arizona...Was his first career pinch-hit homer. Appeared in his first postseason game when he started the NL Wild Card Game vs. San Francisco... Went 1-3 with a single. Made a career-high 87 starts and caught a career-high 784.2 innings, most by a Rays catcher since Dioner Navarro caught 921.0 in 2009...started only 23 of the Rays last 71 games after starting 64 of their first 91…Threw out 23 of 63 attempted base stealers (36.5 pct. ), 3rd-best rate in the majors be hind TOR Russell Martin (38.5) and DET James McCann (36.9)...the league average was 25.4...has thrown out 52 base stealers the past two years, 2nd only to Martin (53)…Led by Rivera, Rays catchers erased 39 of 127 attempted base stealers (30.7 pct. ), an improvement of 11.1 pct. over 2014, and jumped from 25th in the majors to 6th, 2nd-best improvement behind Toronto (28th to 1st)…His career eraser rate of 34.4 (73 of 212) is 2nd best among active catchers (min. 300 games)...trails STL Yadier Molina (40.3)… His 3.59 catcher's ERA ranks 7th among active catchers (min. 300 games)…His .178 batting avg. was 3rd lowest among major league players (min. 250 PA)...his .213 OBP and .489 OPS were the lowest…Made 11 errors, 4 more than any other AL catcher...ranked 2nd among catchers in club history, behind Dioner Navarro in 2007 (14)…April 14 at TOR marked his first career start at 1B and one of 2 he made there in 2015… On April 23 vs. BOS, had his second career walk-off hit, a 9th-inning single off Anthony Varvaro to give the Rays a 2-1 win, their only walk-off win until late September…In two wins, he threw out the potential tying run attempting to steal 2B in the 9th inning: on April 12 at TOR, he nabbed Jose Bautista to preserve a 2-1 win, and on June 3 at LAA, caught Taylor Featherston in a 6-5 victory…In a 4-2 win on May 12 vs. NYY, he threw out Jacoby Ellsbury (21 SB) and Brett Gardner (20 SB) in a 7-pitch span in the 2nd inning, becoming the first Rays catcher to throw out 2 attempted base stealers in the same inning since Dioner Navarro on Aug 22, 2008 at CWS…In a 6-1 win May 14 vs. NYY, he recorded 4 RBI with a 3-run HR and RBI single...he entered the game with a .126 average...according to the Elias Sports Bureau, since RBI became an official statistic in 1920, only three other players have delivered 4 RBI after entering the game with a sub-.130 avg. (min. 100 PA) for the season...by coincidence, they all did so in the same year, 1969: DET Don Wert (May 25), CAL Tom Egan (July 20) and OAK Dave Duncan (Sep 21). Acquired by the Rays from San Diego on Dec 19 in a three-team, 11-player trade, largest in club history…the Rays are the seventh organization he has played for...Posted career highs for the Padres in virtually every category including games (103), runs (27), hits (74), 2B (18), HR (11), RBI (44), BB (27), batting avg. (.252) and OBP (.319)…had only 4 HR in his five previous major league seasons combined (121 games)...His career-high .452 SLG mark as a catcher was 5th among major league backstops (min. 81 games)...Hit 10 HR on the road and only one at Petco Park, where there were fewer home runs hit than any other major league park…his ratio of 15.10 AB/HR on the road was 3rd best in the NL (min. 10 HR) behind SF Brandon Belt (13.90) and CHC Anthony Rizzo (14.11)...Made his first Opening Day roster and went on to start 85 games, including Opening Day… had never made more than 35 starts in a season during his six-year major league career started 47 of the Padres final 74 games when Yasmani Grandal saw more time at 1B…65 of his starts came with the Padres top three starters on the mound: Tyson Ross, Andrew Cashner and Ian Kennedy…the Padres posted a team 3.27 ERA, 2nd best in franchise history...His catcher's ERA of 3.10 was the best in franchise history and tied for the best in the majors with WAS Wilson Ramos…his career 3.41 career mark is 6th best among actives (min. 200 games)...Threw out 29 attempted base stealers, tops among all major league catchers…his 33.3 eraser rate (29 of 87 attempted base stealers) ranked 4th among major league catchers...During his career has thrown out 33.6 percent of attempted base stealers, 4th best among active catchers (min. 200 games)...The major league average over that span is 24.1 pct 40.3 percent of Rivera's called strikes were pitches outside of the strike zone, which, according to PITCHf/x, was the highest percentage among catchers who received at least 2,000 pitches...On May 18 at COL, he threw out 3 attempted base stalers for the first time in his career, one of three to do it in 2014 (also OAK Geovany Soto and DET Bryan Holaday)...His only RBIs in April all came April 28 at SF when he drove in a career-high 5 runs, all off World Series MVP Madison Bumgarner…hit a 2-run double and 3-run HR in the 6-4 victory…his homer in that game was his first major league home run since May 19, 2011 at OAK (David Purcey), a span of 1,075 days...Logged a 3-run single off 20-game winner Johnny Cueto in a 3-0 victory July 2 vs. CIN...Was the first 3-run single in the majors since OAK Yoenis Cespedes on July 24, 2012 at TOR...Became the first player to do it accounting for all 3 runs of a game (i.e., in a 3-0 win) since ANA Garret Anderson on Sep 6, 1998 vs. KC...In a 3-2 victory Aug 27 vs. MIL, hit a home run off Francisco Rodriguez in the bottom of the 9th to tie the game and delivered a 2-out RBI single in the 10th off Zach Duke to win it...Was one of three players in the majors in 2014 to get a game-tying hit in the 9th inning and then a walk-off hit in extras…also CWS Tyler Flowers and COL Corey Dickerson...Following the season played 23 games for the Senadores de San Juan, spending most of his time at 1B…hit .275 (25-for-91) with 2 HR and 6 RBI…also played for Puerto Rico in the Caribbean Series in February...Drew a career-high 4 walks on Sep 1 vs. AR...Had only 5 walks the rest of the month. Opened the season with Tucson hitting PCL-leading .343 before being selected by the Padres on July 7 and spending the remainder of the season with San Diego...Tossed out nine of 16 (56.3 %) of attempted base stealers while with the Padres…the club won eight of his last 10 starts from August 21-September 25...Made his season debut on July 8 vs. Colorado, his first big league action since September 27, 2011 vs. Kansas City playing for the Twins...Finished the season riding a career-best eight-game hit streak from August 31-September 25, batting .423 (11-for-26) over that stretch…left the team three games before season ended on September 27 for the birth of his twin daughters in Puerto Rico...In 74 games for Tucson (AAA), he hit .343 (86-for-251), leading all Padres farmhands in average in 2013 and ranking second among all qualifying minor league catchers...Named to the 2013 Triple-A All-Star team for the Pacific Coast League but did not play due to his promotion to San Diego. Spent the entire campaign with Triple-A Rochester, playing in 95 games for the Red Wings...Hit a career-high 10 home runs on the year with Rochester. Was a spring training invite...reassigned to Minor League camp, March 30...Started the season with Triple-A Rochester...played in 13 games for the Red Wings and had his contract selected by Minnesota as the Twins optioned Dusty Hughes, May 6...Recorded his first hit as a Twin, May 14 vs. Toronto...was his first Major League hit since September, 26, 2006 vs. Oakland, as a member of the Seattle Mariners...Hit his first home run with the Twins, May 19 at Oakland...Optioned to Triple-A Rochester, July 10...went 4-for-5 with two home runs, a double, three rbi and three runs scored, July 23 at Indianapolis...Recalled by Minnesota, August 28...played in 18 games for the Twins to finish the season...Set a single-season career-high, playing in his 36th game, September 13 at Kansas City...set a career-high for at-bats with his 100th of the season, September 24 at Cleveland...Outrighted to Triple-A Rochester, October 14. Spent the season in the Yankees organization after signing as a minor league free agent, May 21...reported to Triple-A Scranton Wilkes-Barre...Split time between designated hitter and catcher, hitting .303 (10-for-33) with two doubles, one home run and seven rbi as a catcher...hit safely in eight consecutive games, May 27-June 12...Transferred to Double-A Trenton, July 5...batted .319 (30-for-94) with 10 doubles, five home runs and 17 rbi in 25 games for the Thunder...Collected 10 multi-hit games...had three three-hit games, including going 3-for-6 with two doubles, a home run and four rbi, September 3 at New Britain...Batted .368 (14-for-38) with four doubles, three home runs, nine rbi and seven runs scored in 10 August games...Played in the Puerto Rican Winter League with Senadores de San Juan, batting .200 (16-for-80) in 25 games. Spent the season with Triple-A Buffalo after signing as a minor league free agent with New York (NL), November 20, 2008...homered in consecutive games, May 29 and 30 at Durham...hit safely in 13 of 15 games, July 22-August 14...hit five home runs and recorded 16 rbi in 19 August games...played 63 games at catcher for the Bisons and three games at third base...became a free agent, November 9...played in the Puerto Rican Winter League with Lobos de Arecibo, batting .241 (14-for-58) with three doubles, two triples, two home runs, eight rbi and 11 runs scored in 18 games. Began the season with Double-A Jacksonville, after signing with the Dodgers' organization, November 19, 2007...played in 38 games for the Suns...promoted to Triple-A Las Vegas, June 2...batted .311 (14-for-45) in 16 July games...went 3-for-4 with two home runs, four rbi and three runs scored, August 20 at Colorado Springs...played with Lobos de Arecibo in the Venezuelan Winter League, batting .269 (28-for-104) with 10 doubles, five home runs, 17 rbi and 14 runs scored in 33 games. Spent the season with Double-A West Tenn...had season-high five rbi, May 21 at Huntsville...had an rbi in six consecutive games, July 12-23...hit safely in nine of his final 12 games. Served as the backup catcher to Kenji Johjima all season. Six of Rivera's 15 hits went for extra-bases (four doubles, two home runs). Rivera was 2-for-3 with two RBIs in a victory over the Tigers on July 9, including a game-tying, two-run home run. Rivera caught two complete games (June 11 and June 17). One of seven catchers to play for Seattle in 2005...Began the season with AA San Antonio...Recalled on May 15, but did not appear in any games before being optioned to San Antonio on May 20...recalled again on May 30... Made his first Major League start on May 31 and also picked up his first Major League hit, a single in the second inning off of Toronto's Chad Gaudin. He was 3x5 with an RBI in that game...Started 12 games at catcher... In a season high five-game hitting streak, May 31-June 12, hit .421 (8-for-19) with two doubles and an RBI...Had six multi-hit games, including three three-hit games...Hit his first Major League home run on June 26 at San Diego, a three-run shot in the seventh inning off of San Diego's Woody Williams..the three RBI were a career-high...Optioned to San Antonio on June 28...In 57 games with San Antonio, hit .278 (59-for-212) with 14 doubles, a triple, two home runs and 21 RBI...Transferred to AAA Tacoma on Aug. 4...Placed on the disabled list Aug. 24 with right shoulder tendinitis; reinstated on Sept. 3...Played in 14 games with Tacoma, hitting .204 (10-for-49) with three doubles, a home run and six RBI...Recalled from Tacoma on September 17...After his recall from Tacoma, hit .467 (7-for-15) in six games with Seattle. Spent season at high-A Inland Empire in the California League...collected a career-high 22 doubles...named to mid-season California League All-Star Team...was hitting .270 on July 2, but hit just .138 (11-for-80) the rest of July to drop his season average to 235...hit .247 (47-for-190) on the road with 12 doubles all six HR and 32 RBI...helped 66ers pitchers finish second in California League in ERA...hit .241 (19-for-79) in 26 games with Carolina in the Puerto Rican Winter League. Spent full season with Wisconsin...batting average (.275) was second on the club...was second in home runs and fifth in doubles...caught 109 games as Timber Rattlers reached the postseason...set new career-highs in all offensive categories. Spent all season with Everett...had 9-game hit streak from Aug. 22-30...named the catcher on the Northwest League Postseason All-Star Team...participated in 2002 Arizona Instructional League, and played winter ball with Carolina in Puerto Rico. Began pro career with Everett...appeared in 15 games with the AquaSox before transferring to Peoria on July 28...batted .338 (24-for-71) in 21 games with Peoria...played briefly with Carolina in the Puerto Rican Winter League...participated in the Mariners Arizona Instructional League. March 27, 2019 New York Mets signed free agent C Rene Rivera to a minor league contract. 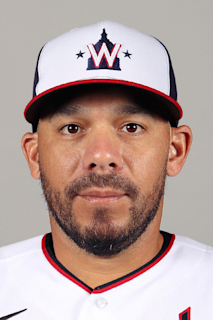 March 27, 2019 C Rene Rivera assigned to Syracuse Mets. March 23, 2019 San Francisco Giants released C Rene Rivera. March 23, 2019 Sacramento River Cats released C Rene Rivera. February 14, 2019 C Rene Rivera assigned to Sacramento River Cats. February 12, 2019 San Francisco Giants signed free agent C Rene Rivera to a minor league contract and invited him to spring training. October 29, 2018 C Rene Rivera elected free agency. September 1, 2018 Atlanta Braves activated C Rene Rivera. August 29, 2018 Atlanta Braves claimed C Rene Rivera off waivers from Los Angeles Angels. August 15, 2018 Los Angeles Angels activated C Rene Rivera from the 60-day disabled list. August 7, 2018 Los Angeles Angels sent C Rene Rivera on a rehab assignment to Inland Empire 66ers. June 23, 2018 Los Angeles Angels transferred C Rene Rivera from the 10-day disabled list to the 60-day disabled list. Right knee inflammation. May 20, 2018 Los Angeles Angels placed C Rene Rivera on the 10-day disabled list retroactive to May 17, 2018. Right knee inflammation. January 9, 2018 Los Angeles Angels signed free agent C Rene Rivera. November 2, 2017 C Rene Rivera elected free agency. October 20, 2017 Chicago Cubs activated C Rene Rivera. October 6, 2017 Chicago Cubs reassigned C Rene Rivera to the minor leagues. August 20, 2017 Chicago Cubs activated C Rene Rivera. August 19, 2017 Chicago Cubs claimed C Rene Rivera off waivers from New York Mets. November 3, 2016 C Rene Rivera elected free agency. April 26, 2016 New York Mets selected the contract of C Rene Rivera from Las Vegas 51s. April 7, 2016 C Rene Rivera assigned to Las Vegas 51s. April 5, 2016 New York Mets signed free agent C Rene Rivera to a minor league contract. March 30, 2016 Tampa Bay Rays released C Rene Rivera. January 30, 2015 C Rene Rivera assigned to Puerto Rico. January 1, 2015 C Rene Rivera assigned to Cangrejeros de Santurce. January 1, 2015 Cangrejeros de Santurce activated C Rene Rivera. January 1, 2015 Cangrejeros de Santurce placed C Rene Rivera on the reserve list. October 30, 2014 C Rene Rivera assigned to Senadores de San Juan. October 30, 2014 Senadores de San Juan activated C Rene Rivera. October 30, 2014 Senadores de San Juan placed C Rene Rivera on the reserve list. October 30, 2014 C Rene Rivera roster status changed by Senadores de San Juan. January 18, 2014 C Rene Rivera assigned to Tigres del Licey. December 4, 2013 C Rene Rivera assigned to Leones de Ponce. December 2, 2013 Indios de Mayaguez released C Rene Rivera. October 31, 2013 Indios de Mayaguez released Rene Rivera. October 31, 2013 C Rene Rivera assigned to Indios de Mayaguez. July 7, 2013 San Diego Padres selected the contract of C Rene Rivera from Tucson Padres. December 26, 2012 C Rene Rivera transferred to Toros del Este from Gigantes del Cibao. December 12, 2012 San Diego Padres signed free agent C Rene Rivera to a minor league contract and invited him to spring training. November 13, 2012 Rene Rivera assigned to Gigantes del Cibao. November 2, 2012 C Rene Rivera elected free agency. April 4, 2012 C Rene Rivera assigned to Rochester Red Wings. January 5, 2012 C Rene Rivera transferred to Indios de Mayaguez from Gigantes de Carolina. December 13, 2011 Minnesota Twins signed free agent C Rene Rivera to a minor league contract and invited him to spring training. November 11, 2011 Rene Rivera assigned to Gigantes de Carolina. October 23, 2011 C Rene Rivera assigned to Tigres del Licey. October 14, 2011 Minnesota Twins sent Rene Rivera outright to Rochester Red Wings. August 28, 2011 Minnesota Twins recalled Rene Rivera from Rochester Red Wings. July 11, 2011 Minnesota Twins optioned Rene Rivera to Rochester Red Wings. May 6, 2011 Minnesota Twins selected the contract of Rene Rivera from Rochester Red Wings. April 6, 2011 Rene Rivera assigned to Rochester Red Wings from Minnesota Twins. February 2, 2011 C Rene Rivera assigned to Puerto Rico. January 11, 2011 Minnesota Twins signed free agent C Rene Rivera to a minor league contract and invited him to spring training. October 30, 2010 C Rene Rivera elected free agency. October 22, 2010 C Rene Rivera assigned to Senadores de San Juan. July 5, 2010 C Rene Rivera assigned to Trenton Thunder from Scranton/Wilkes-Barre Yankees. May 21, 2010 Scranton/Wilkes-Barre Yankees signed free agent Rene Rivera. November 11, 2009 C Rene Rivera assigned to Lobos de Arecibo. November 9, 2009 C Rene Rivera elected free agency. May 13, 2009 C Rene Rivera assigned to Buffalo Bisons from Brooklyn Cyclones. April 28, 2009 Rene Rivera assigned to Brooklyn Cyclones from Buffalo Bisons. December 3, 2008 Buffalo Bisons signed free agent Rene Rivera.